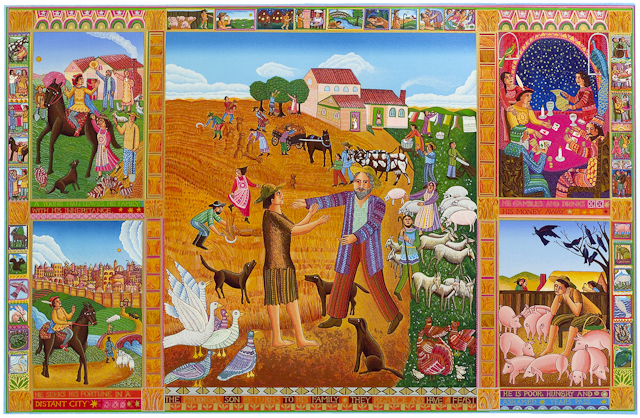 The “prodigal son” parable is a text that speaks of a new form of humanity that refuses to seek vengeance or punishment. I call it a “foundational text.” Just as the United States has its foundational texts – the Declaration of Independence, the Constitution and Bill of Rights, etc. – so also the parable is a foundational text for this new humanity. As long as foundational texts are preserved, examined, read, heard, acted upon, the texts will have their way; they will work in history. God said in Isaiah that his word will not return to him unless it accomplishes its purpose. So with the parable of the prodigal son, it will accomplish its purpose in molding a new form of humanity. We all in one way or another or in several ways, wander off into a far country just like the young son today. Some of us might be in a far country as I speak! The far country doesn’t have to be geographical; it can be mental, emotional, spiritual. A woman of faith that I know in another part of the country called me the other night and tearfully told me of her recent spiritual and psychological struggles. She is in deep turmoil and no longer feels the presence of God even in church, even when she receives communion! I advised her to persist in her prayers and participation in Liturgy and not give in to despair. The words that she prays or meditates on will bring her out of this crisis. She needs patience and not give in to bad “religious” advice that she has received from priests in her area. We all experience dark nights of the soul, even if not to the same degree as this wonderful and devout woman. Regardless of where you are today, this parable works its magic, accomplishes its meaning. That’s why we need to hear it every year. 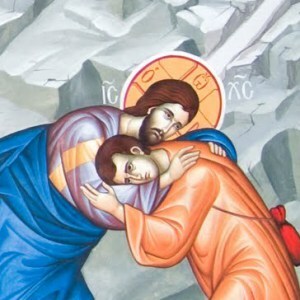 It tells you that God is the God of embrace, as we read in today’s verses from the Triodion. The relationship between father and younger son changes in the course of the story. At the beginning the relationship was formal, and the younger son made a formal request, very businesslike. But now the formality has been replaced by the embrace. This is the purpose of all scriptures: to reveal a God who transcends formal behavior and reaches out wide open arms. The old order has changed. The son goes back groveling; the father lifts him up. Groveling belongs to the old way of doing things. And that old way persists to this day. We grovel before our masters. We grovel before bosses, out of fear of losing a job. Whole countries are told by their paymasters to be silent and beg. This is the case with Greece. This is the way the world functions. And today’s parable stands in opposition and reveals a different way. God doesn’t want grovelers. God says, Stand, arise, you do not need to beg. The older son is stuck in the old way and resents the kindness the father shows to the young son. His way is the one that says you’re either “in” or you’re “out.” And this is the root of all human discord. The father’s way embraces both sons. Jesus leaves the story open-ended, he doesn’t moralize, he leaves it to us to speculate what happens. It is very possible that the younger son does not receive a new share of the inheritance; but he has received something greater – the embrace. The younger son might not receive a new share of the inheritance… UNLESS the older son chooses! That’s the part the parable doesn’t tell us. That’s what makes this parable a true masterpiece of storytelling. The story is left open-ended, because in one way or another every one of us is the older son, stuck in the old way, the old order of things. And in every one of us, the story desires to accomplish its purpose. Categories: Sermons | Tags: embrace, foundational text, new humanity, Prodigal Son | Permalink.